Largest container ship ever dock at the Port of Mombasa – Kenyatta University TV (KUTV). All Rights Reserved. MV. 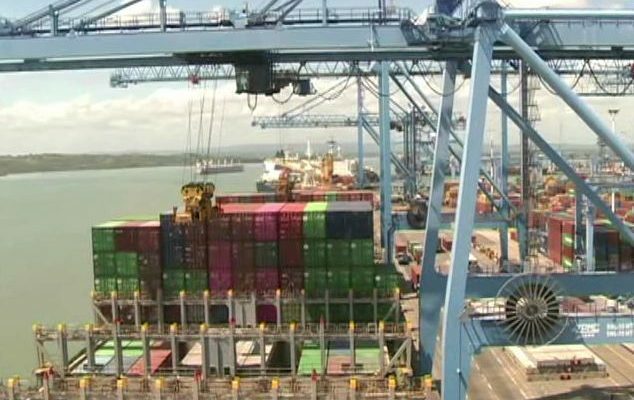 Ever Diamond has become the largest ever container ship to dock at the port of Mombasa. The evergreen shipping line vessel has a length overall of 295 m, a breadth of 32 m, a dead-weight of 55515 tonnes and a gross tonnage of 52090. The port is now edging closer towards attaining 48 hours turnaround time for bigger vessels and enhancing its competitiveness following consistent record productivity performances. In this voyage the vessel loaded a record 9000 full export containers, 1500 empties and discharged 1919 import containers. The ship sailing under the flag of Panama has recorded 1523 moves within an eight hour shift. The new record by MV Ever Diamond comes barely a month after another vessel MSC Maxine hit a record 1450 moves within an eight-hour shift. Kenya Ports Authority (KPA) Head of Container Operations Edward Opiyo contends the new record is a testament of growing port modernization. Opiyo said the records are inching towards 200 moves per hour which is associated with top global ports. Gross moves per hour is a maritime productivity term that defines the total container movement on loading, offloading and re-positioning divided by the number of hours for which the vessel is docked at berth. He said this underscores our commitment to increasing port efficiency which will go a long way in ensuring that we serve our clients better. Evergreen shipping line official Amir Abdelsalam expressed delight on the historic performance. He said the ship left Far East ports and thanked the Mombasa port for offering global shipping services.